.world of WIZ....: La escalada en Espana!!! So where do i start?... Since finishing my epic training cycle, back in early December it was finally time to leave Germany and head south to Spain for the winter climbing season. Since arriving in Europe many months ago, the main goal has always been Spain so to finally arrive and actually see this place for real feels amazing! I started off in Margalef. I am a huge fan of pockets so this was a perfect place to start. I spent the next three weeks or so here camping in the car park and climbing everyday I could. The skin tends to get trashed here pretty quickly so I had to get used to climbing in pain or with a lot of tape! After a week or so of climbing and getting used to the style I was feeling strong. It was time to try something hard! Los Ultimos Vampiros Hippies, a great looking line graded at 8c/33/5.14b involving a couple of hard boulder problems and a lot of mono's! I was Psyched! After some surprisingly fast progress on the route success was near and after only a few days of effort BAM it was done! After this I wasn't to sure when I was going to be leaving so I decided to not project anything and instead just try and climb a lot of things slightly easier than my limit but with only a handful of tries. This was great fun and a great way of training to get fit for the next step. Siurana! End of the day at Margalef, Spain. It is every climbers goal to push themselves to the limit and reach the next step in their climbing and for me, I have been wanting to reach that next step for a while! 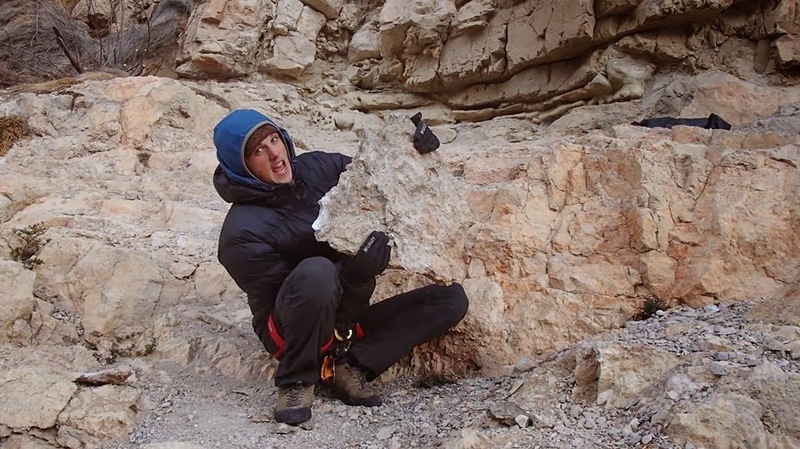 I climbed my first 8c back in late 2012 and since then I have been pushing myself hard to get to that 'next level' in my climbing. I arrived in Siurana early January feeling strong and very psyched. This was going to be the place where I finally break through that barrier. Again the style here in Siurana is completely different so as always I spent the first week or so climbing in lots of different sectors and really getting used to the crimpy and technical style of Siurana. In doing so I managed to claim my hardest flash to date with the popular classic Migranya, 8b. Not exactly Siurana style but a great steep and powerful route none the less. I really had to fight for this one so it was definitely good training for what was to come. Not me! on Migranya 8b. Whoooops!!! I broke it! A large flake from the start of Pati Nosa. 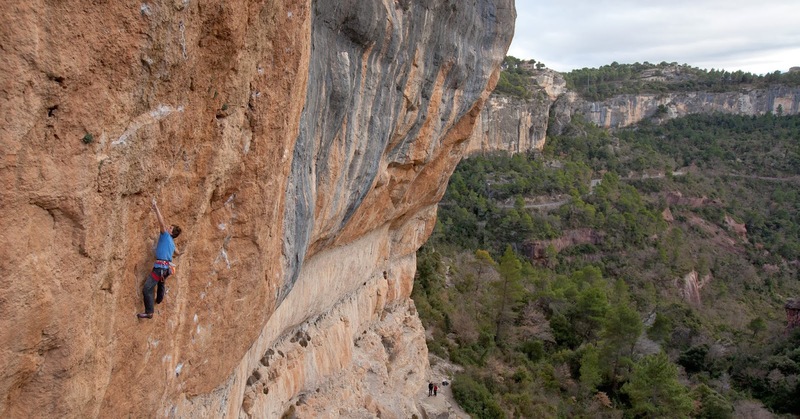 Siurana is home to the famous El Pati sector where there are some amazing and very famous climbs such as La Rambla and Estado Critico as well as many other hard test pieces. A steep 40 meter high orange and blue wall caught my attention immediately and man was I excited to find a project on there to start working on! 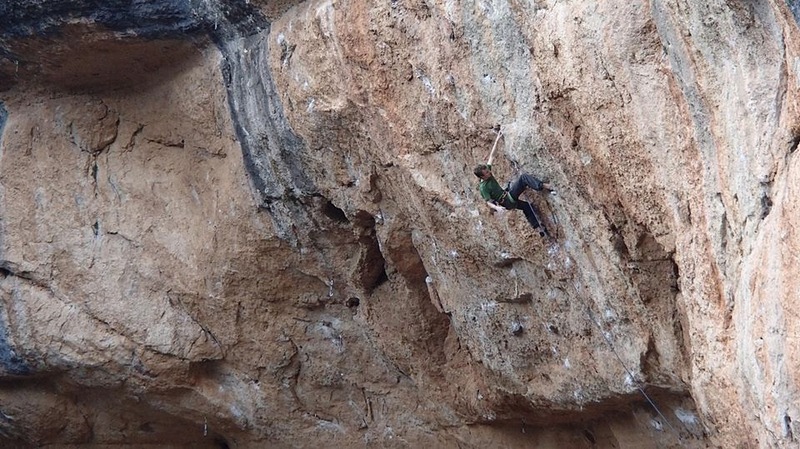 I was recommended a climb called Pati Nosa, originally graded at 8c (a hard one at that) but recently a couple of holds have broken off pushing it in to the 8c+ range. It wasn't to hard to find the motivation and will power to really try hard on it as just to the left Daniel Jung was throwing himself at La Rambla over and over coming very close every time! This was very inspiring and it really made me throw everything I had in to my project. I wanted this one badly. For days and days, try after try I came closer and closer but sticking the first dyno move from the ground became a huge problem for me. Time and time again I would get to the same move, set up, go for it and fall. Very frustrating. Sticking this move definitely did not mean it was over but by this stage I had done it from this point to the top a couple of times now so I knew it was possible! Patience was the key. Each try I tried to stay positive and treat each attempt as training. If I fell off that next attempt would hopefully be that little bit easier. After around 8 days of effort, battling with freezing finger tips, bad weather and whatever else, I was there. I had stuck the move. Luckily for me this was that perfect moment. Approaching the top crux I was feeling pretty damn pumped but I still felt like I could do it...I just had to try hard for a few more moves before easier climbing to the top. I really did have to try hard on the last hard dyno move... It even forced a bit of a grunt (a manly one of course) out of me and that never happens. NICE! So, I climbed Pati Nosa!! My hardest yet. This was the most that I have had to work on a single climb so far but I really enjoyed the whole process. No matter what the grade, I tried harder than ever, got stronger both physically and mentally and have learnt a great deal from my time on the route. In terms of reaching that next step in my climbing I think I can now say that I am finally there! YEY! Time to start chasing the next! !